Cook Lumber has nearly 80 years of experience supplying hardwood green and kiln dried lumber, dimensional stock, veneer logs, pallets, skids and blocking to customers world-wide. Cook Lumber is committed to providing the finest premium Appalachian hardwoods and has grown rapidly from a single distribution facility to a family of forest production companies that process, distribute and export more than 5 million board-feet of hardwood lumber each year. Learn About Our New Woodbricks® Product! Cook Lumber has an unwavering commitment to both the environment and its world-wide customer base. We are dedicated to providing the highest level of customer service and lumber, while maintaining a strict forest management program that is beneficial to the environment as well as Cook Lumber’s customers and partners. 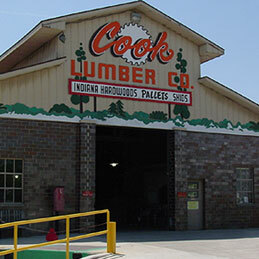 Cook Lumber separates itself from other hardwood lumber companies by carrying retail lumber in-stock and on-hand. Our selection of hardwoods is unmatched and we are willing to work with customers of any size to ensure they have the hardwood product that fits their needs. © 2009-2019 C.C. Cook & Son Lumber Company. All Rights Reserved.